We will look into two methods that can be used to simplify square roots (or radicals): the perfect square method and the prime factorization method. 1. Find the perfect square(s) that will divide the number in the square root. 2. Write the number as a factor of the perfect square(s). 3. Reduce the perfect squares. How to simplify square roots using the perfect square method? The following video shows more examples of simplifying square roots using the perfect square method. The perfect square method is suitable for small numbers for example less than 1000. For bigger numbers the prime factorization method may be better. It would be useful for you to memorize the first five perfect squares of prime numbers. How to simplify square roots by factoring out perfect squares? 3. The remaining factors in the square root sign are multiplied together. How to simplifying square roots using the prime factorization method? The following video shows more examples of simplifying square roots using the prime factorization method. Step 3: Remove the pairs and multiply by each number removed. 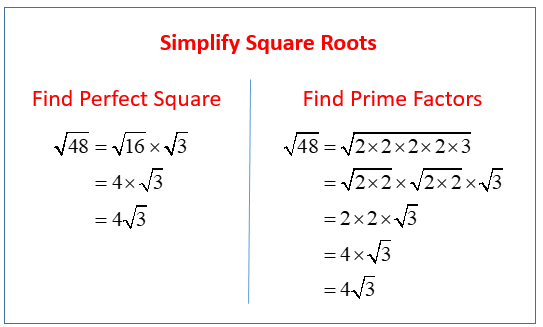 Examples of simplifying square roots using the prime factorization. How to use prime factorization to simplify square roots? How to Simplify Square Roots With Fractions? Examples on how to deal with square roots in the denominator of a fraction.